Study suggests 'snowball Earth' was real and was reversed by 'An ultra-high carbon dioxide atmosphere' | Watts Up With That? It makes you wonder what created all that CO2 millions of years ago. It is rather difficult to imagine, but approximately 635 million years ago, ice may have covered a vast portion of our planet in an event called “Snowball Earth.” According to the Snowball Earth hypothesis, the massive ice age that occurred before animal life appeared, when Earth’s landmasses were most likely clustered near the equator, precipitated relatively rapid changes in atmospheric conditions and a subsequent greenhouse heat wave. This particular period of extensive glaciation and subsequent climate changes might have supplied the cataclysmic event that gave rise to modern levels of atmospheric oxygen, paving the way for the rise of animals and the diversification of life during the later Cambrian explosion. But if ice covered the earth all the way to the tropics during what is known as the Marinoan glaciation, how did the planet spring back from the brink of an ice apocalypse? Huiming Bao, Charles L. Jones Professor in Geology & Geophysics at LSU, might have some of the answers. Bao and LSU graduate students Bryan Killingsworth and Justin Hayles, together with Chuanming Zhou, a colleague at Chinese Academy of Sciences, had an article published on Feb. 5 in the Proceedings of the National Academy of Sciences, or PNAS, that provides new clues on the duration of what was a significant change in atmospheric conditions following the Marinoan glaciation. Bao’s group went about investigating the post-glaciation period of Snowball Earth by looking at unique occurrences of “crystal fans” of a common mineral known as barite (BaSO4), deposited in rocks following the Marinoan glaciation. Out of the three stable isotopes of oxygen, O-16, O-17 and O-18, Bao’s group pays close attention to the relatively scarce isotope O-17. According to Killingsworth, there aren’t many phenomena on earth that can change the normally expected ratio of the scare isotope O-17 to more abundant isotope O-18. However, in sulfate minerals such as barite in rock samples from around 635 million years ago, Bao’s group finds large deviations in the normal ratio of O-17 to O-18 with respect to O-16 isotopes. According to Bao’s group, the odd oxygen isotope ratios they find in barite samples from 635 million years ago could have occurred if, following the extensive Snowball Earth glaciation, Earth’s atmosphere had very high levels of carbon dioxide, or CO2. An ultra-high carbon dioxide atmosphere, Killingsworth explains, where CO2 levels match levels of atmospheric oxygen, would grab more O-17 from oxygen. This would cause a depletion of the O-17 isotope in air and subsequently in barite minerals, which incorporate oxygen as they grow. Bao’s group has found worldwide deposits of this O-17 depleted sulfate mineral in rocks dating from the global glaciation event 635 million years ago, indicating an episode of an ultra-high carbon dioxide atmosphere following the Marinoan glaciation. By using available radiometric dates from areas near layers of barite deposits, Bao’s group has been able to come up with an estimate for the duration of what is now called the Marinoan Oxygen-17 Depletion, or MOSD, event. Bao’s group estimates the MOSD duration at 0 – 1 million years. “This is, so far, really the best estimate we could get from geological records, in line with previous models of how long an ultra-high carbon dioxide event could last before the carbon dioxide in the air would get drawn back into the oceans and sediments,” Killingsworth said. Normally, carbon dioxide levels in the atmosphere are in balance with levels of carbon dioxide in the ocean. However, if water and air were cut off by a thick layer of ice during Snowball Earth, atmospheric carbon dioxide levels could have increased drastically. In a phenomenon similar to the climate change Earth is witnessing in modern times, high levels of atmospheric carbon dioxide would have created a greenhouse gas warming effect, trapping heat inside the planet’s atmosphere and melting the Marinoan ice. Essentially, the Marinoan glaciation created the potential for extreme changes in atmospheric chemistry that in turn lead to the end of Snowball Earth and the beginning of a new explosion of animal life on Earth. While previous work by Bao’s group had advanced the interpretation of the strange occurrence of O-17 depleted barite just after the Marinoan glaciation, there was still much uncertainty on the duration of ultra-high CO2 levels after meltdown of Snowball Earth. Bao’s discovery of a field site with many barite layers gave the opportunity to track how oxygen isotope ratios changed through a thickness of sedimentary rock. As the pages in a novel can be thought of as representing time, so layers of sedimentary rock represent geological history. However, these rock “pages” represented an unknown duration of time for the MOSD event. By using characteristic features of the Marinoan rock sequence occurring regionally in South China, Bao’s group linked the barite layer site to other sites in the region that did have precise dates from volcanic ash beds. Bao’s group has succeeded in estimating the duration of the MOSD event, and thus the time it took for Earth to restore “normal” CO2 levels in the atmosphere. Bao says that he had been interested in this most intriguing episode of Earth’s history since Paul Hoffman, Dan Schrag and colleagues revived the Snowball Earth hypothesis in 1998. However, during a winter break in 2006, Bao obtained some unusual data from barite, a sulfate mineral dating from the Snowball Earth period that he received from a colleague in China. Bao credits his research ideas, analytical work and pleasure of working on this project to his two graduate students, Killingsworth and Hayles, as well as his long-time Chinese collaborators. Bao brought Killingsworth and Hayles to an interior mountainous region in South China in December 2011, where the group succeeded in finding multiple barite layers in a section of rocks dating to 635 million years ago. This discovery formed a large part of their analysis and subsequent publication in PNAS. “Nothing can beat the intellectual excitement and satisfaction you get from research in the field and in the laboratory,” Bao said. Bao’s research is funded by the National Science Foundation and by the Chinese Academy of Sciences. To read the original article, visit http://www.pnas.org/content/early/2013/02/05/1213154110.1.abstract. To read more about Huiming Bao’s research, visit http://www.geol.lsu.edu/hbao/. ← Al Gore's Reality Drop – Climate Change to Destroy Music? So where’s the computation of the change in our spectrum the purported change in CO2 concentration is claimed to have caused ? and according to the program, when the asteroid smacked into Mexico and killed all of the dinosaurs, it also “released” all of the co2 that was being held in the rocks there. I don’t recall how the explained the heating of the snowball. So CO2 really is the mother of all climate drivers after all. That’s me sold. Well written. This is how its done. Do they really suggest that CO2 levels back then spiked up to 200,000 ppm? If so, this provides another line of evidence that runaway greenhouse warming is impossible on Earth. One who changes his theory to fit the available facts. Seems like we found one here. Interesting, although rather a mountain of inference that perhaps lacks an adequate consideration of alternative hypotheses. In particular, when he speaks of an atmosphere that is “half CO_2”, does he mean compared to oxygen? Both oxygen and nitrogen? Would an atmosphere that is half CO_2 (where by hypothesis the CO_2 has eaten O_17 differentially) not have directly observable effects in the chemical formation of carbonates from that era? Are there other ways either oxygen might have been differentially depleted or might isotope ratios have been altered by other exotic events, such as a gamma ray burst or million year alteration in the geosolar magnetic environment, e.g. causing it to be bound up as Ozone or some other oxide? And where the hell did the carbon come from? If one released 100% of the carbon dioxide bound up in the ocean one would multiply the atmospheric CO_2 only by a factor of roughly 60, that is to say, to an absolute maximum of perhaps 10 or 20% of the total atmosphere. But it isn’t terribly plausible that this would happen especially in a snowball Earth situation, because CO_2 is extremely stable in very cold water (which is why the ocean is such an enormous sink — the bulk if it is at the same 4K that it undoubtedly would have been during this cold episode). So the best I can say after reading the article is “perhaps”, but I’m not certain the numbers add up convincingly or alternatives have been eliminated. I might add that it is well known that rates of continental movement and break up were very high around this period, and I’ve read before that some have atttributed this high rate of plate tectonics to the high rates of evolutionary change-the ‘Cambrian explosion’. The high rate of plate tectonic movement and activity would have caused a high rate of volcanism and greenhouse gases, however one couldn’t really decribe this as ‘rapid’, in terms of time frames if would have been over millions/tens of millions of years. Also, there were extensive phosphate deposits on the contintental shelves and oceans at the time which are speculated to have been crucial in the development of the Cambrian explosion-as phosphate is important in higher organisms, these deposits might also have formed under the unusual tectonic context at the time. This particular period of extensive glaciation and subsequent climate changes might have supplied the cataclysmic event that gave rise to modern levels of atmospheric oxygen, paving the way for the rise of animals and the diversification of life during the later Cambrian explosion. No, the great oxygen “catastrophe” began 2.4 billion years ago, 1.8 billion years earlier than the Marinoan. According to Bao’s group, the odd oxygen isotope ratios they find in barite samples from 635 million years ago could have occurred if, following the extensive Snowball Earth glaciation, Earth’s atmosphere had very high levels of carbon dioxide, or CO2. This wholepaper is nothing but religiously driven wishful thinking. Did anyone explain to Bao that data actually exist already on the history of CO2 concentration in the atmosphere? CO2 was sky high – by today’s standards, THROUGHOUT the Marinoan/Varanger snowball earth ice age, as well as the Sturtian ice age that preceded it by a couple of hundred milion years. The peak of CO2 concentration actually followed these glaciations into the Cambrian reaching 10-15000 ppm but oxygen was still at levels similar to today, about 20%, far higher than CO2. I cant believe the language of this paper. It seems sufficient for Bao to fantasise a scenario for it suddenly to become a serious scientific proposal. “What if oxygen only appeared inthe atmosphere in the Cambrian? What if CO2 magically ended the Marinoan ice age?” Yes science really is fun when you play by those rules, its just like writing novels or making films. A pure work of fiction. From just some isotope ratios in barite crystals the whole history of earth’s atmosphere is re-written for compliance with the CO2 religion. This is utterly depressing rubbish. To some extent, our findings demonstrate that whatever happens to Earth, she will recover, and recover at a rapid pace,” Bao said. “Mother Earth lived and life carried on even in the most devastating situation. The only difference is the life composition afterwards. In other words, whatever humans do to the Earth, life will go on. The only uncertainty is whether humans will still remain part of the life composition. Did anyone explain to Bao the existence of a scientific discipline called biology. So life somehow “lived through” the Marinoan and the subsequent CO2 fantasy? What a malign effect all that CO2 obviously had on the bioshpere. What lived before the Marinoan/Varanger? Some bacteria, some “small shelly fauna”, some single celled and a few simple multicelled eukaryotes. And what emerged after the Marinoan after the CO2 devastation? Only the CAMBRIAN EXPLOSION YOU TOTAL MORON!!! Every single phylum of multicellular life (bar one or two) that now lives, emerged in the most remarkable explosion of life-forms in the earth’s history. How can Bao call the Cambrian explosion “devastating” and be taken seriously and accepted for publication? These high priests of CO2 satanism do not have history on their side when they argue that CO2 is a bad thing. But when you have political power on your side, and environmentalism is the new state religion, the beast and the antichrist (metaphorically) then history is yours to be written. That’s why its such fun like people like Bao with creative imaginations. This is why I never believed in anthropogenic catastophe. As a child my scientific parents taught me that the Earth self-regulated. If nature got out of balance, the automatic reactions that kick in will return that balance. You only have to look at the way a plague (of anything) disappears with or without human intervention to realize that. They also taught me that plants breathe in CO2 and breathe out oxygen – and how that flips at night. Marvellous stuff. The activists don’t need to be scared. They don’t need to cull our activities. They certainly don’t need to cull humans. If it’s necessary to the plot (Earth’s, that is, not activists), nature will deal with it. If the alarmists want us to end up back in caves in hunter-gather mode, then all they have to do is sit back and gleefully wait for Earth to do its thing. They don’t have to force us there. I have a lot to thank them for, I might have been a green-idiot were it not for them. The basic problem with this theory is that the temperature response to CO2 is always logarithmic. Even if CO2 levels were to rise from zero to say 10,000 ppm surface temperatures could then only increase by at most 7 degrees. I suppose that the authors then rely on positive water feedbacks and a series of various other tipping points in order to explain the rest of their narrative. The Cambrian Explosion might be a real flowering of life. But there is no doubt that some of the “Explosion” is the development of hard body parts and exoskeletons which greatly aids the preservation of evidence for and the variety of life. The pregnant question is what allowed for the development of hard body parts? Could it be a significant change in ocean chemistry? Even if it had been a gradual change in ocean chemistry using up the buffering capacity of iron-rich waters until the pH and chemical composition of waters changed to allow for retention of calcarious structures that life could begin to use. When it comes to the Pre-Cambrian, the Present is NOT key to the Past. Bao’s previous study using this technique had the CO2 level at only 12,000 ppm at the end of this major glaciation event. The new study doesn’t really put a number on CO2 levels, it just says they were very high for a time. Wait.. I thought the sun was the cause of all climate change. It’s frozen, so where did the CO2 come from? If it was already there, how could it freeze over in the first place? What other literature is cited in the article? “To some extent, our findings demonstrate that whatever happens to Earth, she will recover, and recover at a rapid pace,” Bao said. “Mother Earth lived and life carried on even in the most devastating situation. OMG, they have it backwards. She wants to kill us, like it’s Her job. decay of these transuranic elements. We will never know for certain. them from falling in total lockstep. Another explanation of the end of Snowball Earth is sufficiently large volcanic eruptions covered large areas of ice with dark low albedo material that caused melting. Once the melting starts (ignoring seasons) embedded ash from earlier eruptions accumulates on the surface progressively decreasing albedo in a positive feedback. Accelerating surface melt from embedded material accumulating on the surface is what we see with Arctic sea ice, and with the Greenland and Antarctic ice sheets. These dark debris bands are commonly seen in icebergs indicating several years of net surface melting before enough snow falls in a winter to cover them. A reference to Early Cambrian and Pre-Cambrian (690 ma, 600 ma) Paleogeographic reconstructions. three animations of 62, 180, 659 MB. In order to simulate the Snowball Earth conditions that may have existed during the late Proterozoic we have conducted a series of GCM simulations using a simple 50-meter slab ocean, a reduced solar constant of 6% and varied CO2 concentrations. In this study, we vary the CO2 concentration from 100 to 3400-ppmv and use rotation rates corresponding to 18 and 24-hour day-lengths. 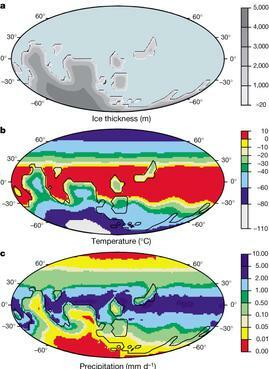 We also examine the effects of increasing the poleward transport of heat by the oceans. Our results show that below a critical value of approximately 1700 ppmv of atmospheric CO2, sea-ice and sub-freezing temperatures occur from the poles to the Equator. A Snowball Earth would have very little moisture in the atmosphere–perhaps so little that clouds would be absent. Insolation would be at a maximum so getting the Earth warmed up after being covered with ice wouldn’t be that difficult. We could credit the sun for warming and melting the snow-bound Earth, not an unusually high level of CO2. Lack of clouds trump CO2 as the reason for the recovery. Not sure I buy this. 1) The logarithmic nature of IR energy absorption by CO2 makes higher levels of CO2 increasingly inefficient as a GHG. 2) The radically-changed albedo of a “snowball earth” may leave very little energy in the narrow IR windows in which CO2 can absorb radiation at all. Is it possible that the study was predicated on a way to tie the current bug-bear, CO2, to interesting geologic observations? I don’t want cooling – even if it makes some climatologists [their word] look a little old-fashioned, shall we say. A gentle warming – say 0.2 C/decade, for the next fifty years – would be accepable. Going from: “According to Bao’s group, the odd oxygen isotope ratios they find in barite samples from 635 million years ago could have occurred if …” to “This kind of an atmospheric shift in carbon dioxide …” is missing the element of proving that the ratios *did* occur due to “very high levels of carbon dioxide.” So what is the current abnomral imbalance in atmoshperic CO2 they’re talking about? It’s pretty low on average, speaking in terms of geologic time. So, the heat and CO2 of prior ages of dinosaurs is normal after snowball earth while we are below normal? With everything covered by ice trapping CO2 in the land, the tundra, the marshes, the peat, and the oceans, it could have been the hand of God that turned on the CO2. This kind of an act of God “is not observed during any other period of Earth’s history.” Study suggests this too. “”Nothing can beat the intellectual excitement and satisfaction you get from [speculating about] research in the field and in the laboratory,’ Bao said.” Study suggests, indeed. But yeah, like he said, life and the earth will go on with or without us. So, what is the point here? High CO2 levels some 635 mln years ago? This is hilarious. CO2 levels then were 6000 or 8000 ppm, or maybe even more, and now 400 ppm and they call that similar? LOL And besides that, I have not been able to find an explanation in this new study of why CO2 was the cause of the warming. If CO2 was that high and causing warming, how could it have been so cold in the first place? I personally think it had something to do with THE SUN. How come the good professor has found a way to prove snowball earth did really happen and then turns it into a CAGW gospel? I think that has to do with MONEY. There it is, the reason for the whole paper. Was the CO2 there when the ice formed? If so, how could the ice form with the CO2 already there? If it wasnt there when it froze up, where did the CO2 come from after everything was frozen? So… we should cut CO2 levels so we can all die in another Snowball Earth. Try http://forecast.uchicago.edu/models.html, Modtran IR model (older code, but good for a rough estimate), with a CO2 concentration of 13% of the atmosphere, or 130,000ppm. That’s an estimated CO2 level to break the Earth out of a “Snowball” state (see http://onlinelibrary.wiley.com/doi/10.1029/2000GL011836/abstract) with some open tropical waters (broader estimates are 10-30%). According to the ModTran code (using standard US atmos., standard cirrus, 70km looking down), that corresponds to a forcing of ~26.5 W/m^2 over current CO2 levels. A Snowball Earth is the wrong metaphor. It is a Europa Earth where single and multi-cellular life that thrives in the ecological niches of inevitable cracks in the ice. CO2 absorbs the radiant energy of ice and warms the planet enough to melt said ice? -T. Rex and the Velociraptors burning coal to stay comfy. Seems to me that there needs to be an explanation somewhere of the inert Co2 before snowball earth happened and the sudden miraculous chemical transformation of Co2 to warm this, so scientific, Mother earth. The first thing that caught my eye was the model of the percambrian “snowball earth” with a modern distribution of the Americas-younger than 65my bp. An indicator of other deficiencies of awareness? Then there is the anomaly of all the high country being ice free, though if all the water was under ice, sublimation might possibly do that, but why would it be where the temperature should be lowest? Then there is the matter of the O isotope ratios. If carbondioxide is pulling oxygen from the atmosphere, this implies the carbondioxide is actually forming in the atmosphere. What from? If it is there anyway , what is the reason for it to undergo oxygen isotope exchange and if it did, the fastest moving isotope is still O/16 so the atmosphere should be relatively enriched in O/17 and O/18 but more so in O/18 which is the reverse of the barite anomaly. Or is this all a hoax and I’ve just been succered into responding? So CO2 levels were ‘very high’ for a ‘time’. Well, the paper probably got him a grant or two since it blames CO2 for global warming. Snowball earth is cyclical. And CO2 has been very high in the geologic past, even during snowball earth phases, so this paper is pure speculation. Good luck with the grants, though. Here are the Continental positions just as this Snowball Earth was starting. Super-Continent Pannotia which was generally moving south at this point. This study shows how the Snowball happened peaking at 635 Mya. Pretty simple. Glaciers build up on land – Super-Continent Pannotia – which was concentrated over the South Pole. Glaciers build up at the South Pole/central spreading region to 5 kms high. They spread out by gravity across all the land and continental shelf possible. Earth Albedo rises to close to 50%. Ocean freezes up to 30S and 30N. Snowball ends when Super-Continent Pannotia splits down the middle (as they tend to do) and land moves away from the South Pole. Perfectly explainable in logical simple sensible terms (and without any magical need to invoke CO2 at all). That does not sound even remotly “similar” to our current situation. As much as I do think Snowball Earth happened, I do not think it happened as Wikipedia illustrates. Which were adopted here. Simple fact that Wegener’s continental drift says could not have been so. At the time posited, Svalbard would have been near the south pole, not the north pole. The transit from south to north over this time rather throws a monkey wrench into static geologic theories. Just facts. All well and good but I am still a bit skeptical about both Snowball Earth and about these levels of CO2. It all sounds net and tidy but I have not read the paper yet. My experience with earth science tells me nothing is ever neat, tidy and all that straight forward. That’s what keeps us earth scientists in business. decay of these transuranic elements. U234 etc are still present. The decay chains for all the extant nuclides are known. I was referring short life nuclides of large atomic weight which no longer exist. That is what I meant by trans uranic. We have no means of knowing just what was created in the big bang. If the gases we know travelled through space along with particulate debris I have to wonder how that happened. If the matter from which the earth was formed was particulate I have to wonder how it was heated up to melting point. The easiest explanation for that is the heat liberated in the decay of short half life nuclides of which we now have no experience or knowledge. To answer a question that has been asked several times. The paper is stating that the normal ballance between air and ocean could have been disrupted by snowball earth, allowing the CO2 content to rise. I would also like to know if there was a hypothisised driver of this new CO2. Total, utter and complete bulldust, IMHO. Firstly, snowball earth has to be absolutely proven – which to my knowledge, it isn’t. Third – everyone is forgetting what caused the snowball earth in the first place! It stands to reason that it must’ve gotten really cold – but why? Moving on – if it did get really cold – what is the reason for this? Obviously if solar power is constant (/sarc) it must have been a climatalogical/biospherical reason (or Extraterrestrial one!). If you have a warm world, which cools – something must have changed – on the realistic assumption that earths emissivity didn’t suddenly double (again why would it?) – the incoming energy must have somehow reduced! End of! Yes, once ice cover increased, albedo may have increased as a positive feedback – but hey – somewhere, the incoming energy was ‘lost’- by very a significant margin. Anyway, it is not unreasonable to deduce that whatever caused the cooling – must have reversed – simply ‘inventing’ an ultra-CO2 atmosphere is ridiculous when considering the general palaeoclimatic variations thought/believed to have existed elsewhere through Earths history………. and for those who want to argue – I am not saying it is all solar – I am saying that palaeo evidence will never be able to give us clear indications of ‘single’ causes. Everyone can ‘believe’ a temporary solar energy loss (for some reason, be it orbital, etc) and a positive feedback from albedo – but isolating a CO2 event for the thawing? Come on! – WTF generated the ‘new’ CO2??? – the place was supposedly covered in ice – virtually lifeless – but CO2 magically appears from nowhere??? – never mind, it probably seeped through the ice from the underlying carbonates?? Here’s a nice animation of continental drift since 600 million year ago (and 100 million years from now). This is pretty cool science. It helps to establish the sequence of events that led to the drop in CO2 and the surge in free oxygen that enabled the Cambrian explosion. Science builds its massive edifices brick by brick and this study could be a very valuable contribution. Even if say for example there was no CO2 in the atmosphere at the beginning of snow ball earth, but at the end of snowball earth there was hundreds of times more CO2 in the atmosphere than there is now, then since snowball earth lasted millions of years that implies that for millions of years CO2 was hundreds of times the concentration we have today, and millions of years at that heightened concentration was not enough to halt snowball earth for a long long time. Therefore, now over the last hundred years or so since we have increased CO2 presumably less than 100ppm, how is this infinetesimal amount of change over a short period magically have such a massive effect? I have always felt that unexplained fluctuations in solar output was the most likely cause for the Iceball Earth conditions, and for it’s subsequent end. I still favor that explanation. Still, I can think of a possible mechanism for the theory he proposes here: Snowball Earth freezes, the oceans are mostly blocked from communication with the atmosphere due to the global ice sheet, and intense volcanic activity in part of the globe fills the atmosphere with gases that are never precipitated out due to the cloudless conditions. Under these circumstances the relative gas concentrations in the atmosphere could change rapidly. I don’t think that makes his theory likely, but I think it makes it possible. Just kidding. Thanks for the references, Bill. Fascinating topic, plate tectonics. OK, so what about all those positive feedbacks and CO2 tipping points that the green cult are always clanging on about. If we had planet snowball and it was warmed by ultra high atmospheric CO2 levels, then why did it not keep warming until the earth was a blackened cinder like all the chicken little types claim will happen… Or do those positive feedbacks only work with magic human CO2? What evidence is there that Snow Ball Earth ever existed ??? Given that earths original atmosphere must have been just like Venus at about 100 bar (earth being larger therefore holding more gas) and almost all CO2 as is Venus today, then its not beyond the realms of possibility that the atmosphere could have been 10 or 20 bar (or more) back then and therefore average temperatures could have been higher. The question has to be what caused the snowball, rather than why we came out, which seems obvious given we can deduce that the atmosphere was still much thicker at the time of the dinosaurs, and would have been at a pressure high enough to heat it up once the cause of the ice house had passed. The question I have is are scientist thinking backwards because they are blinded by the green house effect. This is the obligatory grant-grubbing non-science BS which calls into question the motives and the results of the entire study. Too bad. They might actually be onto something. I think that mostly he’s added one more thing to the list of bizarre phenomena associated with the “snowball earth” — dramatic O17 depletion. I’ve wondered at times if perhaps the magnetic field somehow got decoupled from the rotational axis and the magnetic poles wandered down toward the equator. That would account for both the rapid apparent continental drift (the reference frame was moving) and glaciation at “equatorial” areas that were really polar. But that wouldn’t explain O17 depletion. I suspect it may be many decades if not centuries before we really understand this exotic period of the Earth’s past. We know from 500 million years ago that CO2 levels were in the region of 15 times today’s levels but were drastically reduced as the plant world took hold. As we did not burn up but greened up when CO2 was high the same thing will happen again…in fact NASA have noticed a greening of the planet…even on the edge of some desert areas. Demonising the planet’s number one plant food has always been nonsense….apart from it’s logarithmic nature in creating heat there is the small matter of the lack of warming in the Troposphere. Doesn’t the greenhouse effect require that visible light is first absorbed, then emitted as IR? If the earth really was a snowball, then there would be very little conversion of visible light to IR, and therefore a very weak greenhouse effect, even with very high CO2 concentration in the athmosphere. Steven Mosher says: Wait.. I thought the sun was the cause of all climate change. C’mon Steve, we all know climate change is driven by a wide variety of interacting terrestrial and extraterrestrial factors that exert varying degrees of influence through time. We just don’t see convincing evidence that CO2 is a major player. OMG….so the stegasaur,the bronto,etc breathed CO2.And just how did the “little” lizards survive in the seas? They would have been breathing solid carbonates! And what cheap drugs,besides the cAGW ones,is this guy on? William: Ion modulating phonemon. GRC for example varies ions in the atmosphere and GCR varies depending on the position of the solar system and the galaxy plane. 1. Our old earth was struck by a mighty meteor. 2. The crust broke into the plates, pushing and heaving creating the mountains and valleys we have today. 3. Oil and gas (which are created by reactions at the edges of the earth’s inner core – like Titan) breaks to the surface. 4. The oil/gas ignites and burns at the surface creating the CO2 (I’m assuming O2 was present as this article seems to imply). 5. The ice melts filling up the valleys creating the oceans we have today. 6. Snowball earth suddenly becomes very warm and when the fires go out the resultant remnants have all the ingredients for life. 7. The oil and gas is discovered by humans trapped where the cracks in the plates have allowed it to rise to the surface. 8. Humans use the oil and gas for energy and create more CO2. With a few tweaks I think that settles it. I like the image of the modern day Earth covered in ice. In late Proterozoic times the landforms of Earth were unrecognizable from today’s image. These are gypsum “fans” that grow in the the glacial clays of Lake Agassiz in Manitoba, composed of CaSO4. So-called gypsum rosettes and Barite rosettes are well known to geologists. I think it might be a worthwhile extension of the authors’ work to determine the O17 isotope of these which were also associated with an ice age – the recent one. It would be a good test of the hypothesis. If the Agassiz clays gypsum also has higher O17, then a snowball earth would be proven to not be necessary for their formation. Presumably the ice itself would be higher in O17 and O18 with these reduced in the atmosphere even without a snowball earth. Upon melting, the ice water would bear the heavier isotopes in greater abundance and these would result in gypsum or barite crystals growing in clay from dissolved gypsum or barite in the the “Ice Age” water.bound up in the clay. Why so much gypsum? There are well known large gypsum deposits to the north of the Agassiz clays that would have been ground up by the ice into clay sizes, mixed with other fine clays settling in Lake Agassiz. The clay would have abundant fine gypsum and the water would be saturated with CaSO4. I think it’s more likely, IF snowball Earth really existed, that whatever caused the extreme cold conditions in the first place changed (such as an orbital perturbation), and once the oceans were revealed again, CO2 started increasing dramatically in the atmosphere, outgassing from the oceans. Free oxygen? This is an iron planet. Without plants where did free O2 come from back then? How does the atmospheric oxygen react to form barite if ice separates the precursors? No, as the water cooled, the CO2 would preferentially dissolve in the seawater depleting the atmosphere. After the ice formed, it would seal off the largest source for CO2 in the atmosphere. With no rotting plants on the land, the only source of CO2 would be volcanic activity. Volcanic activity may be the mechanism. It would both emit CO2 and a heck of a lot of dust that would settle on the ice and decrease albedo. CO2, with its logarithmically diminishing effect would not be a serious agent, especially with a very low water vapour content of the atmosphere in a snowball earth situation. Nice try but no dice, let the CO2 go in this scenario- it robs the more interesting part of your paper of “oxygen”. From a long-term imbalance between natural CO2 sources and CO2 sinks. Volcanic activity would have continued unabated during a “Snowball Earth” state, emitting as now ~300 MT CO2 per year. Over geologic timescales that’s balanced by the “biologic pump” of ocean life fixing carbon, which sinks to the ocean floors (and over time gets pulled into subduction zones), and by silicate weathering. Current theory: With the Earth mostly covered with ice sheets, less rock is available to weather, and ocean biology decreases in activity – over time the CO2 would build up. Until the increased forcing melted the ice, increasing natural sinks, and resulting in a lowering of CO2 levels over a few hundred thousand years (http://tinyurl.com/d994sza). Estimates of the amount of CO2 required for the shift from Icehouse range from 10-30% of the atmosphere – given the very high ice albedo and low absolute humidity due to temperature, it would indeed take a lot of CO2. The “Snowball Earth”, “Ice Age Earth” (our current state, oscillating between ice ages and interglacials), and “Greenhouse Earth” (no continental ice, alligators in the Arctic, seen over ~80% of Earth history) are currently considered fairly stable states, with a fairly large bump in forcings required (hysteresis) to shift between these stable states. But I will note that this is an open area of investigation. Svensmark has a lot to say about three snowball episodes 750 – 580 million years ago in “The Chilling Stars.” Possibly his scenario is more likely than this one. 635 Mya, the moon was much closer — about 13,000 km, at a recession rate of 2 cm/yr. Hence, tidal heating due to friction was much higher. I don’t see where the authors took this into consideration. Given a 1/r^2 factor, this should be easy to estimate. I thought they had a professor of Geology involved with this late night gab fest of fantasies that they might throw out as obfuscation that CAGW is a sham. Is a fairly soft brittle mineral that decomposes at/above 1400C (2552F). “Commonly found as a gangue (no vaue) mineral in metallic ore deposits of epithermal or mesothermal origin; but it may also be found as lenses or replacement deposits in sedimentary rocks, both of hypogene and supergene origin”; Courtesy Mindat.org. Metallic ore deposits are thermal deposits and specifically identifying exact age of formation is, well, bordering on bizarre as subsequent thermal activity modifies the deposit minerals. Sedimentary deposits, for example shale, are permeable strata and deposited either as minerals filling available spaces in the deposits or as replacement minerals as the original minerals are dissolved out. — Absolute dating of the mineral. Absolute dating is needed in order to determine before during and after timeframes. Especially for speculation that snowball earth in fact did occur, absolutely. — Determining that the mineral, barite is in fact absolutely unchanged from time of formation. For such a soft brittle mineral sensitive to heat, pressure, tectonics and hot sulphuric acid solutions (not unusual near magmatic or thermal vents). — Doing far more than just assuming that CO2 was/is the reasons for Oxygen ratios in barite. — Assumptions are always very bad things to start with and then look for without identifying all possibilities. Always an interesting challenge when the subject matter in question is greater than 550MYA. — Sedimentary rocks, really really old sedimentary rocks that have not been affected by metamorphic events (tectonics, magma intrusions, thermal vents, mountain building, active faults) or submerged beneath oceans/lakes multiple times only to re-emerge and be eroded again are kinda sparse. — — Yeah, we can show places exist, such as Utah’s oldest fossils. Dates for this kind of old strata are rough, very rough. ** If by some odd chance anyone wants to visit this region of Utah; I highly recommend U-Dig Fossils. Trilobites are well formed, flat, often complete and sometimes rather large. I know some places where I can find trilobites in the shales and slates of the Appalachian mountains, but every one I’ve found has suffered some serious folding from the orogenic mountain building events… Nice flat displays they are not. I am not involved, other than a very infrequent paying visitor. While the quarry is open in the summer, I do not recommend going then. It is rough enough flipping over the black shale so you can sit on the cooler under side; but very difficult when the under side is darn hot too. I am somewhat shocked that anyone knowledgeable in the geological processes would speculate rather freely based on such a fragile mineral. Unchanged over eons it is not. When are you talking about? At the time of this “snowball earth” there was no North AMerica or Europe. If you mean the recent manfiestations of the continental crust which are called N.America and Europe, I must differ with you – MOST of N.A. was not covered – during the most recent glacial maximum the western areas were mostly ice free all the way to Alaska and the east was ice covered all the way as far south as northern New Jersey. Granted that Canada is larger than America, one could conclude the MOST of NA consists of canada as it comprises more than 50% of the land area, but much of Western Canada was ice free in the most recent glacial max. Or are you talking about the previous three of the recent glacial maxima – Illinoisan, Nebraskan and Kansan? In which case there were variations in the above distribution. Before anyone reads that paper one should answer the question. Where is that carbon now? Given all known estimates of oil, oil reserves, shale, coal and even guesses at Methane clathrate can not even come close to sequestering that amount of carbon. So why even consider this paper? Imagine all the dissolved CO2 in the ocean waters under that ice due to undersea vents with the water around 28-29 degrees, heavy with salts as well as dissolved gasses. Then the earth warms up, the ice melts, the water temps spike up to 40 then 50 then 60 degrees. Ocean circulation begins with deep sea currents rising to the surface. The dissolved CO2 is liberated. Looking up the solubility of CO2 in water and then assuming all the oceans were saturated then, I get a total C02 mass of 4.1×10-18 kg – which almost approaches the current mass of the entire atmosphere which is 5.4×10-18 kg. Taking this further, the average temp of the ocean is listed at 3.9 C. The difference between 3.9 C and 0 C (snowball earth) in terms of solubility of CO2 is about 0.4 g/kg of water. Plugging that into the total mass of the oceans yields 5.48×10-17 which is about 10 percent of the total mass of the atmosphere. Taking this even further, looking at the slope of the solubility vs temp graph, I get a slope of .08 g/kg/C for the saturation of CO2 in water. Plugging in a .01 change in ocean temp, I get a release of 1×10-15 kg of C02 for each rise of .01 degrees. The total mass of C02 in the atmosphere is around 3.6×10-15 kg. It would seem that even very small changes in ocean temp drive massive releases of C02. No wonder CO2 releases lag earth temp changes. I recently saw a map of the extent of ice cover during snowball earth. It showed ice down to around Texas. Can’t find it now. But I’ve had the Lindzen quote saved for a couple of years. As a geologist, you know more about this than I do. I’m surprised anyone would ask this question — it’s been roundly covered in the literature in recent years. The total fossil fuel resource base is about 12,500 GtC (Swart and Weaver, Nature Climate Change, Jan 2012). I’ll leave it to you to convert that into atmospheric ppmv. of today’s mammals are from the period AFTER the carboniferous era. “West Virginia today is mostly an erosional plateau carved up into steep ridges and narrow valleys, but 300 million years ago, during the Carboniferous Period, it was part of a vast equatorial coastal swamp extending many hundreds of miles and barely rising above sea level. This steamy, tropical quagmire served as the nursery for Earth’s first primitive forests, comprised of giant lycopods, ferns, and seed ferns. North America was located along Earth’s equator then, courtesy of the forces of continental drift. The hot and humid climate of the Middle Carboniferous Period was accompanied by an explosion of terrestrial plant life. However by the Late Carboniferous Period Earth’s climate had become increasingly cooler and drier. By the beginning of the Permian Period average global temperatures declined by about 10° C.
Interestingly, the last half of the Carboniferous Period witnessed periods of significant ice cap formation over polar landmasses– particularly in the southern hemisphere. Alternating cool and warm periods during the ensuing Carboniferous Ice Age coincided with cycles of glacier expansion and retreat. Coastlines fluctuated, caused by a combination of both local basin subsidence and worldwide sea level changes. In West Virginia a complex system of meandering river deltas supported vast coal swamps that left repeating stratigraphic levels of peat bogs that later became coal, separated by layers of fluvial rocks like sandstone and shale when the deltas were building, and marine rocks like black shales and limestones when rising seas drowned coastlands. Accumulations of several thousand feet of these sediments over millions of years caused heat and pressure which transformed the soft sediments into rock and the peat layers into the 100 or so coal seams which today comprise the Great Bituminous Coalfields of the Eastern U.S. and Western Europe. Earth’s climate and atmosphere have varied greatly over geologic time. Our planet has mostly been much hotter and more humid than we know it to be today, and with far more carbon dioxide (the greenhouse gas) in the atmosphere than exists today. The notable exception is 300,000,000 years ago during the late Carboniferous Period, which resembles our own climate and atmosphere like no other. Vast glaciers up to 8,000 feet thick existed at the south pole then, moving from higher elevations to lower, driven by gravity and their tremendous weight. These colossal slow-motion tidal waves of ice destroyed and pulverized everything in their path, scraping the landscape to bare bedrock– altering mountains, valleys, and river courses. Ancient bedrock in Africa, Australia, India and South America show scratches and gouges from this glaciation. Earth’s continents during the Carboniferous Period were arranged differently than they are today. South America, Africa, India, Australia, Antarctica, and a few minor pieces were joined together near the south pole to comprise the supercontinent known as Gondwanaland. Gondwanaland was a formidable polar landmass. While ice caps and glaciers can’t grow large over open oceans, they can and do attain great thickness over polar continents– like Gondwanaland. 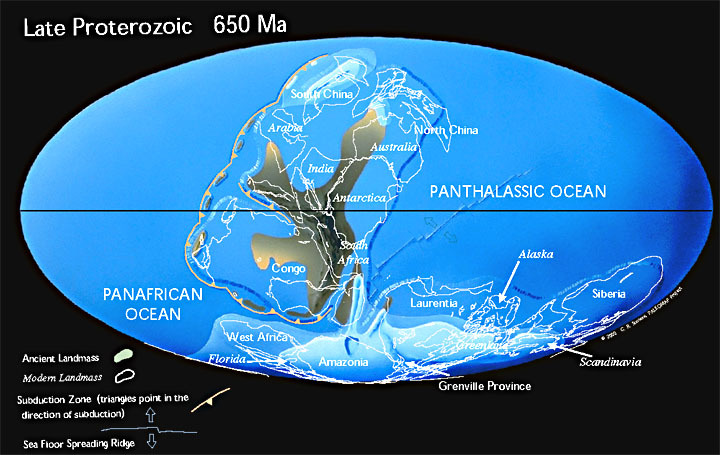 Throughout the Carboniferous Period, continental drift was rearranging most (but not all) of the Earth’s landmasses into a single supercontinent stretching from the south polar region to the north polar region. Although the precise mechanisms involved are still a matter of debate this appears to cause regional humidity changes and redistribution of ocean currents which in turn promote ice accumulation and glacier formation over the earth’s polar continents. These glacial ice caps grow larger during periods of reduced solar input, and because ice caps are very good solar reflectors this tended to accelerate and perpetuate cyclical relapses to global cooling. So, according to other scientists – who don’t make their money trying to spread a carbon-die-oxide catastrophic awespell – this whole theory matches no other facts before or after or since or during those ice ages. Great response. I hope you will be submitting your thoughts to PNAS for publication in rebuttal to this misguided paper. Yes? The sun is why we have a climate to change. The sun can change the climate. The climate can change without a changing sun. Wild fires and volcanoes can change the climate. Mostly they just change the weather. Algae can change the climate and the weather. The sun can change the weather. It happens all the time. We have evidence. We don’t have evidence that people can change the climate. Are there other ways either oxygen might have been differentially depleted? Say for example the evolution of oxygen breathing micro-organisms (early animals) that could survive under the ice without photosynthesis. The problem with the CO2 = GHG = warming theory is that it cannot explain how the earth recovers from an ice age, because the CO2 gets bound up in the cold water under the ice, as does water vapor itself. The atmosphere dries and CO2 goes into solution. If GHG = warming there is no way for the earth go get out of the snowball. The more rational explanation is that GHG actually cools the atmosphere which in combination with gravity creates the lapse rate. This is self-evident when you look at the atmosphere above the GHG layer. Without GHG the atmosphere would be isothermal, or increase in temperature with altitude as we see in the layers of atmosphere above the GHG layers and as we see in the oceans and as we see in the sun’s atmosphere. Thus as the earth cools and GHG is bound up in the oceans, the cooling effect of GHG is reduced, which in combination with the small eccentricity in the earth’s orbit, warms the planet and brings us out of the ice age. It is the warming effect of reducing CO2 and H2O in the atmosphere that explains the paradox of how the earth gets out of ice ages, which should be impossible give current GHG = warming theory. In point of fact, Climate Science has got the sign wrong in one of the most monumental scientific stuff ups in human history – which is saying something. Temperatures increased co-incidentally during the past 300 years due to reasons unrelated to CO2 and GHG, which has led a generation of scientists down the wrong path. I second PeterMG’s 4:53 pm observation that the atmospheric pressure in the Late Pre-Cambrian is likely a lot higher than today. PeterMG says it could be as high as Venus, near 100 bar. I won’t go that far. I go with the catastrophic creation of the Moon from an Giant impact of the a proto-Earth an another proto-planet. See “Giant Impact Hypothesis”. If that is true, I view it as one reason we don’t have a Venusian thick atmosphere and why the Moon is desiccated. So I think it prudent to work with a late Pre-Cambrian atmosphere anywhere from 50 -10-2 bar (80% conf distribution). points to a thinker atmosphere then than now. So the lesson here is pay more attention to paleo-atmospheric pressures before getting to ppmv estimates of gas fractions. Maybe partial pressures would be a useful shortcut. Scotese’s reconstructions for 690 Ma and 600 Ma show continents accumulating around the southern pole. Scotese holds open (held?) the possibility that the inclination of the axis was much greater than today. The Rare Earth theory hold that the Moon is a necessary influence on keeping the Earth’s axis stable. I think the moon’s inclination would have to be at a bigger angle to the ecliptic, too. So can the moon’s orbit inclination be reduced by Venus, Mars, and Jupiter gravitational influences? So if we had a highly inclined Earth’s spin axis, enabling extreme seasons and thick ice caps over a northern ocean, then a Snowball Earth is easier to sustain. Conceivably, we have a 10 bar atmosphere, with ocean dwelling life and nothing that we know of further out of the water than Stromatillites. Correct me if I am wrong, but how in the world did co2 levels rise to such high levels without leaving evidence ? Was it magical co2 ? In other words we see no evidence of levels as high as they claim here elsewhere. A clever fiction, but we still have co2 levels at around 5-6k ppm during this era and nothing even close to what they are claiming. For the trolls: learn to think before you post. I know how the CO2 got there. James T Kirk and the Enterprise went back in time (they do that all the time anyway), and beamed in a CO2 bomb, similar to the Genesis Device. And BOOM! CO2. The “Snowball Earth” refers to a series of glaciations between 750MA and 570MA, not a single event. Some prefer the term Slushball as they are not convinced of the extent of the glaciations. Individual glaciations are estimated to have had durations of between 4Ma and 30Ma [Hoffman et al, Science 281]. And individual glaciations are believed to have ended extremely abruptly [see discussion http://isites.harvard.edu/fs/docs/icb.topic568107.files/snowball_poster.pdf%5D. During a snowball glaciation photosynthesis by algae would have dropped dramatically while CO2 would have risen as volcanism would have continued on as usual. So where was the CO2 greenhouse warming? What caused the glaciations? Hypotheses abound. What ended the glaciations? Hypotheses are similarly abundant. Bao and his mates may have part of the answer but we don’t even know what the whole question is yet. The question is always whether the temperature responsiveness to carbon dioxide levels is constant under all scenarios or whether it changes radically. Here you are saying that, with a huge ice covering, responsiveness to high carbon dioxide is significant. I’ll let others determine whether it was in fact the carbon dioxide which triggered the temperature changes, as opposed to something else which was accompanied by it. If we are at todays’ temperatures or warmer, where ice coverage is limited to the Poles, what actual conditions pertain in terms of responsiveness to carbon dioxide?? I don’t think you can possibly extrapolate from an ice-covered world to an ocean-exposed world. It would be like saying that because Usian Bolt can run 100m in under 10 secs, so could I. There is no logic in that assumption whatsoever. This is an interesting article to have on WUWT.. It explains that when CO2 is increased the Earth warms up.. Are you trying to point out that CO2 has to be in a high concentration for it to warm up the Earth? Because this paper is looking at a period on Earth a long time ago when the Sun was weaker.. Or are you trying to show that we will all die from increased CO2 but over millions of years it will be weathered out of the atmosphere and what little life is left will survive? This was an hypophesis put out some 10-15 years ago and shown opn the BBC. They claimed that volcanos couldn’t erupt through ice for centuries and then, all of sudden it inlarge numbers. All the CO² released then warmed the earth. Just can’t believe myself. The BS alarm was going off like a siren. Correct me if I am wrong, but how in the world did co2 levels rise to such high levels without leaving evidence ? The evidence is supposedly in the amount of carbonated rocks found at that stratification level. 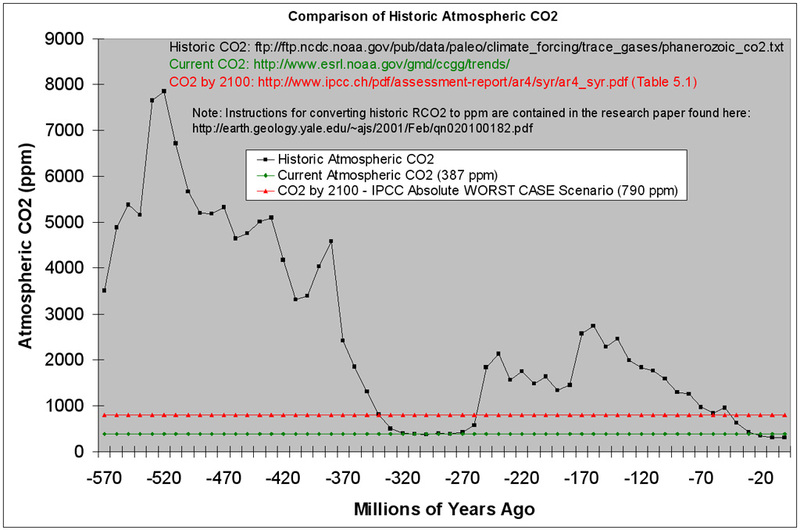 If you notice, the CO2 concentration in the atmosphere was never proposed to rise above (even with error) 10k PPM. So how did these proxies get it so wrong assuming this study is worth anything? This is the kind of lazy science and lazy thinking that really kind of gets to me. In other words, the evidence that we have are “strange” rocks from one location on the Earth that are 600 million years old. Who knows what kind of processes created the deficient O17 in them? 600 million is a long period of time after all and to say that the proxies are wrong without actually proving anything is rather bone-headed and lazy type thinking. Perhaps if they at least pointed out that their theory is in disagreement with standard scientific thoughts about this period then I would be more in line to accept their conclusions without anymore disagreement. But the point is that the carbonated rocks are scant proof against numerous other studies that put CO2 concentrations of the atmosphere in our past closer to 5k PPM. Are these studies now all wrong? Personally, the entire theory that CO2 is the lone culprit to climate change is just as bad as Mosher going on about the “sun” to every sceptic. Its just as lazy to do either one, because solar, greenhouse gases and numerous other factors change the climate which as a chaotic system does not have just one input. It does not even have one driver. The truth is that the Earth’s climate over the eons is effected by numerous factors which have to all be considered before you even begin to describe the climate. In this case, the study here only considers ONE possible attribute to what made the climate change and to top that off they could not even get that one possible attribute to agree with the current science. Pure laziness nowadays if you ask me….. Interesting point, a significant number of the new phyla at the Cambrian explosion did indeed learn the trick of calcifying their tissues. Shelled organisms and animals with mineralised armour plates proliferated – consider the monster Anomalocaris for example, as did corals and other sessile calcified organisms. They did this while atmospheric CO2 levels were in the range 10,000-15,000ppm. But this is most odd, since current climate dogma is that increases of a few tens of ppm from the current ~400 ppm are going to cause the calcified shells of marine organisms to start dissolving. The “acidification” coral scare is utter nonsense and even the “dim sun” can get them out of it. So much here that is crap. First the Snowball Earth theory was debunked a few years ago by several studies but the most notable was the research of sediments of that age in Scotland. Ocean bed deposits contain drop stones. These, as the name implies, are stones large and small that have dropped from icebergs floating in OPEN water. Open water implies a lack of total ice cover that the SB theory claims. Another study at Imperial College, London calculated that the increase in albedo that total ice cover gave would negate any melting thus ensure that the ice age would never end. Though ”never” may be too strong a word melting delay would have changed the geological history that followed. Secondly the proto atmosphere was nearly all CO2 with some ammonia, sulphur dioxide, hydrogen chloride etc. Oxygen was first found in the atmosphere over 2 billion years ago due to the photosynthesizing by cyanobacteria that grew into stromatolites still seen in Western Australia. The oceans then were far different to today’s in that they contained a lot of soluble iron which was precipitated out around 2Ba ago because of the oxidation forming the banded iron formations now a rich source of iron ore. This caused a great anoxic event stripping oxygen from the atmosphere and converting ocean waters to something like we now have, providing water far more likely to propagate life, and increasing atmospheric CO2 levels. Cyanobacteria continued to modify the atmosphere to increase oxygen levels through photosynthesis. Most atmospheric CO2 was sequestered as limestone, the most plentiful of sedimentary rocks, a little as fossil fuel. There is still, thankfully, CO2 in the atmosphere to continue the carbon cycle of which we are but a small part. Without this life giving gas we would not exist and earth would be a wet dead planet. It has never driven climate only life. This was an hypophesis put out some 10-15 years ago and shown opn the BBC. Yes, I saw that Horizon program. But their evidence for a snowball Earth included glaciation in Africa, and glacial drop-stones off the coast of Africa, which ‘proves’ that the whole Earth was glaciated. But now I see that Africa was down at the South Pole, at the time, so glaciation around Africa is hardly surprising. Errr, so just what is the ‘evidence’ for a snowball Earth?? Does this not put into question Warmists’ arguments about past higher co2 levels and subsequent glaciations – assuming their assertions that the far lower co2 levels of today’s levels is the main driver of climate? So many problems with that paper, as others have already brought up. The most obvious one from the viewpoint of CO2 heating the atmosphere and melting the ice is: where did the LW radiation come from that CO2 would then perform its magic on, if nearly all the SW solar was being reflected by the ice? So, according to these guys who’re probably being paid by someone’s taxes and using their own assumptions of GHG’s, the Snowball Earth was radiating freezing temps and when the unbelievably high concentration of CO2, which magically appeared from who knows where and acting totally on it’s own without regard to any other earth or atmospheric components, started backradiating the freezing temps downward, was able to suddenly melt the Snowball. Al Gore will love this and media advocacy lapdogs will of course lap this up. Gee, science is so simple, but it’s obvious it means we’re doomed-again. Is this article written by Anthony Watts? I ask because it seems odd him making the statement “However, if water and air were cut off by a thick layer of ice during Snowball Earth, atmospheric carbon dioxide levels could have increased drastically. In a phenomenon similar to the climate change Earth is witnessing in modern times, high levels of atmospheric carbon dioxide would have created a greenhouse gas warming effect, trapping heat inside the planet’s atmosphere and melting the Marinoan ice.”. ?? Earth’s albedo would have been quite high when covered in ice. During that period, Earth would have continued to receive a dusting from meteorites, asteroid impacts, etc, covering that ice in layers of dust, decreasing the albedo and leading to melting of the glaciers. I remember years ago, in “Scientific American”, when “Scientific Amrican” was scientific and Ameican, about “Goldilocks and the three planets. Volcanoes release CO2 into the atmosphere, rainwater washes that additional CO2 out of th eatmosphere. “A fully active carbon cycle acts as a thermostat, regulating a planet’s climate.,,,,,.The carbon cycle has similar negative feedback. Suppose the Earth gets too warm. Then more water will evaporate from the oceans, and the additional precipitation will remove CO2 from the atmosphere, moderating the Greenhouse effect and cooling the planet. If the planet cools too much, less water will evaporate and there will be less precipitation to remove CO2; the CO2 will build up, warming the planet. Does anyone have a clip of Harry Morgan (Colonel Potter, MASH) shouting, “Horse apples!”? That’s what comes to mind while reading the article. Very insightful.This brings me to a news flash for all. The only antidote for the corrosive socialist environment that your children are obliged to go through in schools and universities, is a thoughtful, interactive two-way education parents can provide through teaching, discussion, listening, argument (keep it on the rails as best you can!) and doing things together. I give myself a C+ on this score (there were six of them plus two nieces for a few years, so hard to hold back the chaos) and managed to make a couple of physicists (one who served as a post doc at Scripps and JPL, a mathematician-philosopher, a poet (and furniture mover), a linguist and MBA, a performing classical musician, and all of them classical musicians (remarkably, the music appears to have come from me playing homey-homely banjo songs to them at bedtime). Exhausting but it works and C+ is sufficient. This seems plausible, but that’s all. The atmospheric pressure is important too — almost certainly higher or much higher than now, causing different atmospheric circulation patterns. 200000 ppm CO2 at a much higher pressure? Don’t think that’s relevant to today’s atmosphere, other than for scaremongering. What happend 5-6-700 millions years with Earth’s climate is a pretty difficult task? I mean we have huge problems with the last 10.000 years dont we? If you dont know the historic airpressure at sealevel your lost? Bao’s group has found worldwide deposits of this O-17 depleted sulfate mineral in rocks dating from the global glaciation event 635 million years ago, indicating an episode of an ultra-high carbon dioxide atmosphere following the Marinoan glaciation. Following the Marinoan glaciation by definition there was warming which increased the CO2 from soil moisture, decomposition of oceanic organic matter and the oceans. That is not a case as Bao implies for CO2 causing warning. What caused the Marinoan glaciation must be factored into what caused the end of the glaciation. Since it appears, based on what is in WUWT’s post, that was not addressed. In which case the paper is not grounded well contextually. It appears relatively high CO2 levels going into the Marinoan glaciation and during it plus after it would be a very important aspect in a paper on the Marinoan glaciation phenomena. However, to me that does not appear as a primary focus in the paper. I give it a grade of C+. The authors can improve it and I hope they do. Ah, so it’s to be turtles, er, I mean CO2 all the way down, eh? I like the collision, hot spot, volcanic winter theory better. Consider a major planetary collision which punched a hole in the crust, forming long periods of volcanic activity. After a strike, the atmosphere immediately fills with dust and gas, albedo is high, solar penetration is low, temperatures drop. Because of the new hot spot, ongoing volcanic activity from the impact refreshes atmospheric particulates and sulfates and CO2, but it is optical albedo effects which keep solar penetration low that’s responsible for cooling the lower atmosphere, rather than CO2 and other gases inhibiting the escape of infrared radiation. After many years, of course the impact site cools and new crust begins to form, or plates, moving more quickly now because of the impact, cover or impede the hot spot. Volcanic activity slows, skies clear, and you get rapid warming? This seems much simpler than blaming CO2. 1) With ice covering the Earth there would have been little dust and no clouds which would have reduced significantly the major players in the GHE today. Could CO2 have made up for that loss? Doubtful. 2) We see almost no troposphere at the poles today. With the lack of warmth we should see basically none over the entire Earth. That means little convection and light winds perfect for optimal radiation to space. The CO2 that was present could have precipitated out of the atmosphere, especially during night and at the poles. 3) What is the albedo of a an Earth covered in ice? 90%? Without something in the atmosphere to absorb sunlight (H2O and dust) almost no energy is captured there either. How does it ever warm once the CO2 rains down on the surface? Without answering some of these question this paper is without much scientific depth. Following the Marinoan glaciation by definition there was warming which reasonably can be viewed as a cause of increased CO2 from soil moisture, decomposition of oceanic organic matter and the oceans. That did not come out clearly in Boa’s PR statement. Interesting comment to make. Given that the water is cut off, then the main positive feedback mechanism assumed in the climate models cannot possibly be acting in the same way in the case of the snowball Earth. There will be a slight increase of vapour pressure of water over ice, but the change in vapour pressure over ice between -10C and 0C is about 0.25 mmHg per degree; over water at 15 degrees it is around 0.75 mmHg per degree as far as I can find, so the feedback should also be about a third today if this is a strong feedback mechanism. I accept that less of the Earth will be feeding in vapour today, but with the coverage of oceans, with existing ice caps feeding back in the same way and with inland water, forest and all but the driest land contributing it must be greater than double the snowball Earth feedback if water vapour is causing feedback. I leave others to ponder the implications of this, mostly because I have very little idea what they are. Most of all it depends if the models are right that water causes positive feedback or the interpretation of empirical evidence that water causes little or negative feedback is correct. By the way – what is that about this being revived in 1998? I finished my Earth Sciences degree in 1995 and it was certainly mentioned as a possibility. It was thought unlikely because of the lack of known mechanism to break out of the high-albedo state, but it was accepted that there was strong empirical evidence. My lecturers had respect for empirical evidence, even that contrary to their scientific model. I read Snowball Earth http://www.amazon.com/Snowball-Earth-Maverick-Scientist-Catastrophe/dp/1400051258 almost a decade ago. Have it on my shelf. I though she presented the case fairly convincingly back then. This fits with what was known when the book was written. Subducting sea floor along faults produces volcanoes that liberate CO2 from calcium carbonate. If snowball earth shuts down most photosynthesis and volcanoes continue to liberate CO2, then CO2 could rise until the greenhouse effect melted the ice. How? Perhaps the relatively infinitesmal amounts of organic material oxidize on their own? Decomposition as commonly understood is a cycle of life process where life consumes life. Otherwise life’s liquid components (minerals or chemicals if one prefers) are either washed away or the water is evaporated and the precipitates become part of erosion. It took heat and pressure to convert plant/animal matter into coal (metamorphosis). Without animal/plant consuming dead things we’d just have buried dead things. – As mentioned there is no identification of the beginning, concurrent or consecutive events surrounding snowball earth. Sure makes one wonder just where their CO2 proof or even far fetched possibility arises from. Increasing CO2 levels from the oceans is a strong possibility as the ice melts and the water vents excess CO2 to maintain equilibrium balance. Remember, the CO2 equilibrium level in salt water falls as the temperature rises. But with such a high level of atmospheric CO2, just how high can the percentage go and how much CO2 is required to change it? One thing is clear, atmospheric CO2 levels will not quickly decline when ice melts. And the whole volcano thing erupting huge amounts of CO2? Just where did the CO2 come from? Nowadays it is believed (that faith word again) that subducted calcium carbonates (fossil critter skeletons) are the primary source of the CO2 when the mineral CaCO2 is decomposed under heat and pressure. I guess they’ll have to invent scenarios to stoke the volcanos with CO2 in frozen gaia land as copious cubic miles of subducted calcium carbonates might be unlikely 670 MYA. Why? My understanding of water currents is that their causes are many; but earth’s temperature modifing ocean currents have the main driver as warm water flowing in over cold water sinking. Does that change in snowball earth? The Continents coalescing in antarctica’s position might (another of those loose words) allow a large south pole ice cap (assuming that magnetic south as defined by today’s poles). why would that cause a North ice cap of any size? ‘Coriolis’ effect, glaciers spreading out across open water by gravity or even the ocean water freezing across such vast reaches; are interesting explanations to me… Angular momentum over a sphere would… do what to encourage iceball earth? How does the coriolis effect help make a snowball earth? Is there an assumption that ocean currents become exclusively parallel to latitudes? If we look around for a current model for water motion we can turn to the atmosphere. I suppose all winds will eventually be parallel to latitudes? Intermixing of cold/warm water I’d expect as similar to atmospheric cold/warm air mixing. Supposing, just for argument purpose, that the currents did somehow become parallel to latitude. I suppose there is firm erosional evidence of such currents? Are these current presumed to circle the world? Given that the heat/cooling effects are withdrawn that returning underwater currents do not exist? And these waters are supposed to freeze solid? Did I forget to mention tides? Tides and currents serve to break up ice, especially at the higher latitudes where tidal change is greatest. atmospheric winds and ocean currents circling the earth would also be detrimental to oceans freezing solid. You appear to be correct. Assuming the life in the pre-Cambrian ocean was basically bacterial-like and not plant-like, it’s decomposition would release only incidental amounts of CO2. I was thinking, incorrectly that the pre-Cambrian ocean had some significant plant-like life which involves CO2 release during decomposition. FUBAR of the first order, if the image is any indication. Why? Because they show the high elevations snow-free. Do I have to explain it? I don’t think so. Thanks for drawing my attention to this, Anthony. I’ll have a read. This time in the evolution of a habitable Earth is of considerable interest to me. We have some rocks of this age in NW Wales that a bunch of geologists are currently working on. I highly suggest that people go back and read the important papers in this debate. There is a lot more to this hypothesis than was discussed in the paper mentioned above. That being said, I find anything involving oxygen isotope ratios from this period of time to be immediately suspect. One of the observations made consistently in the early literature is oxygen isotope ratios are notoriously unreliable in these sediments. The only pattern found is chaos. The most interesting observation , however, is a consistent negative Carbon 13 to Carbon 12 ratio in the cap carbonates above the glacial sediments. The carbonates also have some very odd sedimentary features. I wish I could find my personal file. I used to have all the important early papers in this argument. I tend towards scepticism on the hypothesis personally, but there is also too many odd observations for me to completely rule the hypothesis out. A snowball Earth could have in excess of 50% albedo with reasonably fresh snow. A quick look at a 50% albedo energy balance gives an average surface T of about -40C assuming no atmospheric blocking. As long as the albedo stays high, it stays very cold. However, volcanic ash and space dust and aging ice will potentially start to warm areas up and where it gets warm enough to melt the ice, the albedo can start dropping and eventually comes the thaw, at least at lower latitudes. Our modern glaciation periods don’t really go beyond about 100,000 yrs before we reach an interglacial. Perhaps massive concentrations of co2 shorten the time significantly. I doubt the snowball Earth could have maintained total cover for very long because there is an awful lot of solar energy coming at the equatorial regions and sooner or later new snow turns to old ice and even ponds which start to become very low albedo. Deep ocean albedo tends to be under 0.04 at solar incidence angles that matter. That means most of the energy incoming is absorbed and there’s no clouds to reduce the effect until you start losing that total ice cover. A Reference on Paleo atmospheres. O2 is 15% Cambrian-Devonian, rising to 35% (peak) late Carboniferous crashing to 15% end of Permian. The elevation of oxygen partial pressure to an atmospheric concentration of 35 %, when coupled with a constant nitrogen partial pressure, increases rates of oxygen diffusion by approximately 67 %. This value probably represents the maximum increase during the Paleozoic oxygen pulse and would clearly have had a substantial impact on the function of respiratory systems. The amount of nitrates, limestone and coal in the ground leads me toward much higher Paleozoic atmospheric pressures before these rocks were deposited. But I do have to wonder if it is even possible for a Snowball Earth if we had a 10+ bar atmosphere. Even with an SO2 Catastrophe somehow made airborne, does a Snowball require a thin atmosphere? Wouldn’t you have to know what caused snowball Earth in the first place to be able to tell how it ended? For all we know a big rock hit, kicked up a bunch of junk in the atmosphere, and cooled everything down and as it settled out, things warmed up. I know, probably much too simple for a grant huh? What kills this article for me is the underlying warming theme… that ol co2 did something it’s actually not doing now.. but hey if it did it then just imagine what high co2 can do if it isn’t snowball earth. In a backdoor sort of way, it is no different than Hansen’s Earth will be Venus someday claim. Not incorrect John. Tough to be incorrect about someone else’s speculative ideas. Just not given all relevant details so that you can make a true judgement call. As another long term poster at WUWT would say, “this doesn’t pass the smell test”, the details why only confirm the suspicion. A suspicion that if I read your posts correctly you already have; you’re just giving the theory room to grow, if the researchers can prove validity. I admire your open thoughts; only I hear their PR as another way of researchers saying they want more funding to prove their speculation. My thoughts lean towards the word ‘bogus’ until the researchers return and as you pointed out above, present a complete picture of events with proofs for start, continuation and end of frozen earth time. Plus all major issues that bother us silly geologist types such as Dan the Geologist’s concern above. I agree with Dan, only I have problems with barite remaining unchanged over 670MYA. I’ll ask about ratios when the mineral is proved to be original 670MYA old depositions and that all relevant samples around the world are near identical. Perhaps when Dan finds his files he can post relevant information, questions, answers and thoughts that he has in his files? It is simple to think of the ocean as a simple body of water, land as a lump of dirt/rock, air as something immediate about us and earth’s core as something that occasionally burps a volcano. Taking the time to step back and ask about our planet, biosphere and solar system as a whole is something the CAGWers seem determined not to do. especially when one throws in the surrounding cosmos. Our earth may be small as planets go, but it is incredibly huge as mankind goes. Man’s largest dents to earth’s surface are small surface pertubations easily eroded away over geological time. When taking an air flight I am always absorbed in the distance to ground image during take off and landing. At what heights do we lose sight of people, cars, trucks, houses… The surprising thing is that much detail gets lost in the background quite quickly. Taking that thought and wondering if we lose sight of all that within five-seven miles and there are many miles of atmosphere above us, just what have we lost sight of? The ground earth we live in or the earth as a totality? This is before we add in 8,000 miles of rock below us and the same level of atmosphere as above us. I do read your posts and Bill Illis’s too as you are both posters of science, discussion, counterpoint and opinions worth digesting. Or as an outsider might say; you both convey information that help resolve my owninternal thoughts and arguments about CAGW issues. The Marinoan glaciation is at the very limit and a bit beyond of our ability to reconstruct the position of the continents by apparent polar wander. Beyond about 500mya the wander paths get very wanky to the extent one must consider true polar wander. Scotese’s reconstruction is by no means consensus. I’m sticking with the uniformitarian approach that since we are nearly certain none of the Phanerozoic glaciations were any more than snowcone earths, why should the Marinoan, a mere 150 million years older than the Ordovician, be different? it’s true – there are too many odd observations – but that just ‘allows’ the speculative widening of fairly sensible hypotheses into drug crazed WAGs! Speaking as one geologist to another – we can often infer certain things occurred, and we can presume and speculate some reasons for such occurences – but, ( geologically speaking ) that is all we can do………we have no choice but to base our geological and palaeo inferences on current observations and ideas, for example. But in truth, we have little proof or high degree confidence or confirmation for many of our presumptions? To my mind – geological interpretation is less reliable than tree ring interpretation! e,g .you have some tree rings, but you cannot say whether the growth variations were temp/co2/rainfall/nutrient caused, or a mix of all of them in alternating patterns, etc! Now take a few hundred metres of rock cross section and subsequent detailed paleao analysis and tell me that its any more accurate!? Geological generalisations are ok in my book, they do usually make sense – but further detailed ‘deduction’, sprinkled with a liberal dose of ‘I’m looking for this’ is not the way to promote Earth Sciences IMHO. “But gas bubbles from a given period get buried deeper than ice of the same period, making it hard to tie past temperatures with atmospheric changes. “They focused on ice from 20,000 to 10,000 years ago, which encompassed the last period when the planet warmed naturally and glaciers melted. The team measured the concentration of nitrogen-15 isotopes, or atoms of the same element with different weights, at different depths throughout the ice cores. They compared the depth of that isotope with the ice composition for all the cores to determine the distance between ice bubbles and ice from the same period. The team found that global warming and a carbon dioxide increase happened at virtually the same time — between 18,000 and 11,000 years ago. If “water and air were cut off by a thick layer of ice during Snowball Earth, atmospheric carbon dioxide levels could have increased drastically”. How then could the atmospheric composition affect the depositions of Barium sulphate? It seems that carbon dioxide is the usual suspect in studies of global warming. As water vapor the primary radiative coolant of the troposphere, (cf. Robert Clemenzi, The Greenhouse Effect) I wonder if global water vapor depletion might have been a factor also? Plausible, but a far cry from being even a hypothesis. Firstly, oxygen isotopes can be altered by any number of things as the authors have themselves acknowledged. So this line or reasoning leads to the prosecutors fallacy. Thirdly, an alternative hypothesis needs to be considered, such as plate tectonics and vulcanism. Did vulcanism lead to more black carbon deposits? What would be the effect on albedo? Another hypothesis are orbital variations. What do we know about changes in eccentricity or obliquity? Can we even go back that far? What of asteroid impact? A 1/100 my event would be stretching coincidence a bit, but what sort of effect would a 1/1 my event have? Many things to consider then, before we can say “it was co2 what dunnit.! I have toyed with another problem of a Snowball Earth. Photosynthetic life continues, at least at the Equator. Proof: it didn’t go extinct. So Oxygen is continued to be generated and it is consumed by life that survives. The working assumption is that O2 concentrations in the atmosphere are low. Why? Oxygen is a very reactive substance. But what consumes oxygen in a PreCambrian atmosphere above a near global ice cap? It has been proposed that a 35% oxygen atmosphere is the maximum possible on Earth because above that concentration forest fires become rampant. Combustion is spontaneous. In the PreCambrian, however, the land is barren with or without ice and snow. There is nothing to burn all life is below the surface of the water or in the tidal zone. What then keeps O2 concentrations in check? If there is a Snowball Earth, could it be caused by a decline in CO2 and rise in O2 in the atmosphere? If so, could a rich O2 atmosphere then crash by “burning” anoxic sediments built up slowly over millions of years and evolution of burrowing life? Could a crash of O2 and rise of CO2 by burning Cambrian sediment “fossil fuel” end the Snowball? I admit it is pure speculation. But when dealing with the era of the Cambrian Explosion, we have to remember “We are not in Kansas, anymore.” The dry land is barren. The atmosphere might or might not be thick. The sun was probably dimmer. Big Asteroid Impacts are probably more frequent than today. Axis tilt more than today? The Earth is a pretty alian planet. Comment from Atheok….. “And the whole volcano thing erupting huge amounts of CO2? Just where did the CO2 come from? Nowadays it is believed (that faith word again) that subducted calcium carbonates (fossil critter skeletons) are the primary source of the CO2 when the mineral CaCO2 is decomposed under heat and pressure. I guess they’ll have to invent scenarios to stoke the volcanos with CO2 in frozen gaia land as copious cubic miles of subducted calcium carbonates might be unlikely 670 MYA”. No need to invent any scenarios as there is plenty of carbonate available pre-670Ma. A little in the early and mid Archean [pre 2500Ma] and plenty in the late Archean and Proterozoic [ see http://sp.sepmonline.org/content/sepspcot/1/SEC6.abstract%5D. The Carawine Dolomite of Western Australia has been dated to 2630Ma. I would think 2000Ma is enough time to subduct a bit of carbonate to provide a source of CO2 for snowball/slushball era volcanoes. So where the hell did all that water vanish to ? If all of the planet land sea and air is covered by ice, or even feshly fallen snow, where did all that water come from, in order to cover everything, and more importantly, where did it all go to ? Was all of earth’s land in Antarctica, or what ? Hardly seems possible to me, that you can have thousands of feet of ice all over the planet, with the amount of water we have and the altitudes of some of the land. Vince Earth’s current purported average surface Temperature is 288 K and the peak of the LWIR emitted spectrum is about 10.1 microns. If the peak got shifted to 15 microns, where peak CO2 absorption is, then the average Temperature would have to be around 193 K, or -80 C, so about like Vostok station in Winter midnight. So how are you going to get the whole earth bathed more than 50% in sunlight to be as cold as Vostok in the complete absence of solar energy, and at such a high altitude compared to most of the surface (which is at sea level) ? See the wiki photo of earth covered in ice. You want ice, or you want snow ? I’m not sure you can have both. You need evaporation to get snow. In the Arctic and Antarctic, snow comes from moisture evaporated from oceanic waters. Cover those oceans with ice as in wiki photo, and no moisture for snow. And with no moisture, no clouds, not much to cause water enhancement of CO2 absorption. Albedo isn’t going to be 50%. Sun illuminates 50+% of earth all the time, and it rotates so most of snowball earth is going to get some daylight sun, which is going to melt the snow surface. (fresh snow, has an excellent anechoic light trapping geometry). As a result, snow reflectance doesn’t stay high for more than a few hours. Melted snow is transparent, and once solar energy enters, it gets trapped by TIR, so reflectance drops way down, close to the 2-3% reflectance of water. With anything like the earth’s current orbit, and the sun’s current output (say last billion years), an earth without LIQUID oceans, is somewhat untenable. If you don’t have liquid oceans, you don’t get fresh snow; if you don’t have fresh snow, you get melt ice. If you have optical water surface (liquid or solid), you get very low reflectance of solar spectrum energy. You don’t get 50% or higher reflectance. So picture a snow covered earth (all of it oceans as well) all 90+% scattering “reflectance” your “high albedo state”; how to break out of that (with a degree in Earth Sciences)?? Picture the low relative humidity over snow covered terrains, and the consequent lack of clouds which would contribute to the high albedo state. Picture an incident TSI of around 1362 W/m^2 and very little atmospheric water vapor to absorb much of that, so a surface irradiance of >1,000 W/m^2 seems more than plausible. With 90% reflectance, only 100 W/m^2 is going to be absorbed by the snow. Picture the known poor thermal conductivity of snow; its a great insulator; so that 100 W/m^2 absorption is going to be in the surface layers of the snow, and some of it is going to melt and create liquid water, and when the solar blowtorch passes on by, that liquid water will refreeze, and form ice, which is virtually transparent to solar spectrum radiation. That will increase the surface absorption by TIR trapping; and that effect will as they say “snowball”. Exit stage left high albedo state; enter stage right, low albedo state. I wonder if Professor Bao (or anyone at LSU) has ever actually seen snow; freshly fallen dry powder snow, or same stuff after the winter sun has shone on it for an hour. So why the hell would you dig up some rocks to look for Barium Sulphate, just to figure out how snow melts ?? Amazing isn’t it … all that ice at a time Earth’s atmosphere contained enormous amounts of CO2! And now Earth only has a minuscule amount of CO2 in the atmosphere… and yet it has an ideal warm climate! Doesn’t that say something about the insanity of the IPCC mantra? for the 3-4% deep ocean albedo, you’ve got to have that deep ocean visible, either thru clear ice or instead of ice. Fresh powder gets you >50% albedo but as it compacts down into ice, you’ve got something else. You need clear ice to drop dramatically. Maybe you get some nice clear ice/water in melt pools but with nonclear ice below, it will still be higher than deep ocean. Land tends to run between 12-18% albedo – much like Mars or the Moon. Consequently, you’ve got to lose a lot for the snow or packed snow turning to ice to be really bad. Ultimately, it is going to lose out to the sunshine, especially as it gets more compacted and dirtier. Those melt ponds may well not remain melted over night as the lower RH is going to give some evaporative cooling even with T above freezing and it likely will take a while for that. The average power is still going to be around 341w/m^2 and there is an awful lot of ice in 1 square meter when there is 1 or 2 km of thickness. Well I’ve looked into the deep ocean through nothing at all (stuck my head down in it) and I can assure you that it isn’t visible at all. If you have a lot of phytoplankton, then you get some back reflectance, but without it you see blackness. much of it is trapped by TIR (Total Internal Reflection). The human eye is a very poor judge of reflectance of solar energy. The very best off the shelf antireflectance filter you can buy (for camera lens protection) has less than 0.3% reflectance over the visible range. The reflected solar disk seen off that filter is still far to bright to be viewed by the naked eye; you would swear the image is half as bright as the direct sun view, yet it is only 0.3%. And you can check that low reflectance yourself, by reflecting the solar disk onto a shadowed surface, and comparing it to an ordinary piece of window glass or even some high priced brand AR filters, that claim to be low reflectance (they aren’t).. The point is that the high Lambertian scattering of fresh dry snow, gives a high reflectance in the sun, for only a few minutes that it takes to melt the surface crystals, that refreeze into glassy facets. The eye thinks it looks brighter, but it is getting fooled by the specular reflection of the solar disk that comes off randomly oriented facets, into ther eye. And once there is absorption in the icy snow, then simple heating creates a continuous melting process, that just accelerates. Yes it will refreeze when the sun goes by but it will never again be high albedo. And where do you get this 341 w/m^2 number from. The TSI is 1362 W/m^2; that is an AREAL POWER DENSITY figure, the RATE at which solar energy is delivered to the surface (don’t forget the typical attenuation to around 1,000 W/m^2). 342 W/m^2 probably can’t melt the snow, but 1,000 W/m^2 can. Power and power density, is an instantaneous quantity; you do NOT average power numbers. One 20 kton bomb on San Francisco every 25 or 50 years, really is not very much average power. Try convincing the citizens that it won’t do very much damage (on average). The spots on earth that are in daylight receive about 1,000 W/m^2 (normal to the sun vector); whenever they are in daylight . The spots that are not in daylight receive basically zero, all the time they are not in daylight. They particularly do not receive 341 W/m^2 when they are not in daylight. The 341 is an average. Remember that not just night and day but 1362 (or more like 1000 w/m^2) is occurring only when the Sun is very high overhead. Other than local noon directly at where the Sun is directly overhead, you start to suffer from the trig angles and thicker atmosphere. Remember too that scattering intensifies at the 180 deg. reverse direction. And again, my point was that while clear ice approaches that of deep water in albedo, even old snow has significant albedo compared to most of Earth’s surface. The fact that Earth has about 0.3 albedo is due to clouds and atmospheric scattering when there is no massive glaciation. Otherwise it would be somewhat less than Moon or Mars due to the vast oceans. While fresh snow doesn’t last long, not so fresh snow is still going to be higher albedo than land surface averages. Also, the simple concept is that today’s Earth reflects about 30% of incoming (albedo) and the atmosphere traps about 30-40% of the outgoing surface radiation. Averages turn out that Earth is warmed by around 239 w/m^2 of incoming which is balanced by about 239 W/m^2 radiated mostly from the surface which makes it through the atmosphere and clouds. Of the difference in what is radiated from the surface and what makes it out the atmosphere, about 1/3 is due to clouds and 2/3 to ghgs, primarily h2o vapor. If much of the h2o vapor goes away along with the clouds, it will require less surface T to balance the incoming. Note that the h2o is like co2 in that a doubling or halving has a relatively little effect so a serious decrease in absolute humidity is going to have a fairly small change – somewhere around 2-3 times that of a co2 change. Co2 halving is close to around 10% of the total co2 contribution. If we assume a simple albedo of around 30% for this glaciated world without clouds and with fairly low h2o vapor, our average temperature needed for balance would still be very close to 0 deg C. Any albedo above 0.3 would essentially drop the average to below 0 as would any serious drop in absolute humidity. Even current conditions have our average only about 15 deg C.
Power is a rate of doing work, or a rate of using energy, or a rate of transport of energy; it is a differential quantity with an instantaneous value. I think I just said you cannot average power or power density. Average power is a meaningless concept; on average NOTHING is happening. And I beg to differ on when and where the sun delivers 1362 W/m^2 to the earth (of which about 1,000 makes it to the surface) assuming about air mass 1.5 which is the usual assumption from which available solar energy calculations are commonly done. You also missed that bit about the area normal to the sun vector. You still get 1362 W/m^2 normal to the sun vector, no matter where the sun is (presumably above the horizon). Yes the air mass absorption and scattering reduces what you get at low sun angles, but the TSI is still 1362 W/m^2 even at the north pole during daylight hours; but air mass numbers are higher so the 1,000 W/m^2 at the surface comes in a bit lower. The whole point of steerable solar collector arrays, is to point the array normal at the sun, wherever it is. And the problem is that most of earth’s albedo is a consequence of clouds; NOT snow and ice. Albedo is NOT a reflection coefficient, it is the fraction of solar spectrum EM radiation arriving at the earth, which is redirected away from the earth as solar spectrum EM energy, unmodified. Processes which change the wavelength of solar spectrum energy are not contributors to albedo. If it doesn’t escape from earth capture, as solar spectrum radiation without inelastic processing; it isn’t a part of albedo. The “reflectance” of fresh snow can be very high; but if that snow is on top of Antarctic land or Arctic ice, well there isn’t much solar spectrum energy there to reflect, so the contribution to albedo is miniscule. And we do know that there isn’t much solar spectrum energy in the Arctic or the Antarctic; it is conjectured that may be the reason it is so cold there, so that you get all that ice and snow sitting around. The ice and snow, do not make it cold in the polar regions; it is the cold in the polar regions that makes the icea and snow. Cooling of the earth takes place during the post noon hours in the hot tropcal deserts, where the cooling rate is more than ten times what it is in the polar night times. They tell us that the earth BB equilibrum Temperature is about 255K. At that Temperature 341W/m^2 isn’t going to melt anything; but 1362 W/m^2 surely will. I somehow don’t think you could sell me a hi fi stereo sound system. A typical symphony orchestra covers about a 96dB dynamic range during a concert (the ones I might attend anyway), and if you average out the power output of the orchestra and feed that to the audience; they waill all fall asleep. “Average power” and “RMS power” are nonsense gimmic terms invented by shyster audio sales people. Power is power; instantaneous power, is what knocks your socks off at a French organ recital. Pretty much everything has an average. Temperature itself is an average. TSI at the N pole may be 1362w/m^2 for a lambertian disk but that lower angle of incidence means the actual number of m^2 getting that 1362 W is going to be more, making the average less. Also, at low angles of incidence such as one experiences at higher latitudes, even water loses that low reflectivity and starts providing some serious reflections (glare). Ice is going to radiate with its characteristic BB curve too. Its LWIR peak is not limited by SWIR or visible reflectivity which would lower the emissivity. I’ve never stated the current ‘cryosphere’ played much of a role in today’s albedo. It is only where there is minimal solar incoming and even water would provide a relatively high reflectivity at the lower angles of incidence. I am a firm believer in the IRIS effect. I don’t know if LIndzen is right about cloud reflectivity variation (due to different nucleation particles) or if it is more the simple crude concept of more cloud cover vs less cloud cover but we have a setpoint control system for temperature. When glaciation occurs, we have a short circuiting of this mechanism as the high surface albedo replaces the cloud albedo so things get stuck on cold until such times as things warm up enough again. That 255k is based upon the simple average of 239 W/m^2 is coming in so there must be that average going out for there not to be a loss or accumulation of heat energy and hence a necessary change in temperature. The reason why our average surface T is around 288K is that in order for earth to radiate that much (239W/m^2) the surface must radiate another 150 W/m^2 due to the trapping or blocking of the atmosphere of close to 40% of what is radiated. Change the albedo value from 0.3 and you’ve got a seriously different amount of absorbed incoming power than 239 W/m^2 so there’s big difference in what the surface T needs to be. Also, if the snowball scenario takes place, you’ve got major differences in what will be trapped – especially if there’s no clouds and very little h2o vapor. BTW, that 90dB of orchestral variation when combined in a typical auditorium with 30db average noise is going to put you at 120db which is the threshold of pain. It’s also an acoustic power density of 1W/m^2. Considering that sharp noises are more damaging to hearing than continuous noises and that long term damage can begin well below 120dB, it would be problematic for that wide of a dynamic range unless you have important sounds going on that are less than the room noise. A question I sometimes give students is if one is producing 100 W of acoustical power, under perfect conditions and assuming the inverse square law is in effect, how far away could someone theoretically hear it? A paper I read from Octave Levenspiel, T J Fitzgerald, and Donald Pettit was interesting; it proposed a much elevated air pressure ~4-5 bar of carbon d. I doubt it is religiously driven and suspect it is scientifically based. I particularly like the idea of our sister planet’s atmosphere being a model for our own. Indeed, did not the strange differences in planets first strike the scientific researchers when our tech allowed us to speculated as to why the differences?